HAVE YOU BEEN SACKED, let go, made redundant, or recently signed a settlement agreement with your employer? Perhaps walking away from your role, your boss or the company you work for is something you have been thinking about for a while. If this issue impacts you personally, or you are simply interested in how to handle being the person without a job title, I think you’ll find this article useful. This article is practical in nature although, of course, it cannot cover all eventualities. I have concentrated on how you might deal with the emotional and personal aspects of change rather than the employment law aspects of being dismissed. My advice on this latter point is to refer to ACAS and, if appropriate, seek out the services of a good employment lawyer. As a former Group HR Director, I am happy to recommend where to look for a good employment lawyer. However, at this stage, please remember that talking to people you know and trust should bring about recommendations to consider. In the end, it is your choice. Two notes for your consideration before we get started. 1. Change is personal – Change is often likened to being on a rollercoaster. When it happens to you, change can feel like a deep dive into the unknown or waiting for a wave to pass over when you don’t know if the calm sea will return. With this in mind, you might notice I’m writing this short article in an irregular format. I want to encourage you to dip in and out of what I’ve found useful over many years of working one to one with leaders; researching intrinsic motivation, why we do the things we do; leading numerous business transformation projects and reorganisations across a number of countries and business sectors. At this point, why not take a moment to think about a quotation from the poet Mary Oliver. I’ve chosen this line because the words always encourage me to focus on possibilities, knowing that, in the end, it is my life and I can change my mind. 2. Confidentiality is always important – When I work with a client there is a confidentiality clause in our contract. I am sure you appreciate therefore that any reference to client experiences in this article have been adapted to create relevant case studies and provide you with practical food for thought and points of reflection. 1. Change is not always a smooth process. We are all in a state of constant change and transition. Just consider what might be possible tomorrow: there are some things we know about and some things we are comfortable discovering as we go along. We tend to trust that, in normal circumstances, we can deal with what comes our way tomorrow and the day after. However, when we think we are not in control, or that things are out of control, our feelings can become overwhelming. We need to re-establish a sense of belonging, trust in ourselves and other people, and a belief that, even if we do not know everything right now, we have a sense that there is a place for us in the world, there is a purpose to our life and can create a way to move forward. Indeed, it is our strengths, the things we are already good at and enjoy, that will help us move forward when things get tough. Whilst change conjures up a sense of forward momentum, think about taking a breath. It can be helpful to give yourself permission to do nothing for a while, knowing that what might be seen as procrastination can be a good thing. Taking a moment to do nothing, allowing creativity to happen and ideas to emerge, is a powerful skill that we each have the ability to draw upon. It is matter of taking a breath and waiting. Do you know why people say they have their best ideas in the shower, out walking, playing golf, or maybe running around with the children in the park? Now is not the time to go into the science of the brain and the interaction of various chemicals. Just know this time of being relaxed can allow abstract ideas to surface, connections to be made, enabling you to tap into what we might call intuition: the sum of all you know and have experienced at this time in your life. What a resource! A breathing exercise you might find useful if you ever feel overwhelmed – It might sound strange but when things get tough, many of my most business-focused clients find imagining they are breathing in from their feet to be extremely calming. Whilst I know this is impossible, the process of focusing on your breath slowly coming in through your feet and out through your nose or mouth can make the difference between feeling overwhelmed and calm. It allows the wave I mentioned earlier to wash over and for calm to return. The important point is to take your mind to your feet and imagine the breath. You are taking control. Do try this technique and notice how it works for you. 2. Rational behaviour can be overrated. By this I mean facts and the figures are important. However, in most situations a draining conflict is best avoided, even if you believe the facts are in your favour. If you are leaving a company and have the opportunity to negotiate a deal, I know, as a trained negotiator, it is important to check the figures and get a good deal. All matters of principle should be considered in the cold light of day, preferably with someone you trust who can challenge your thinking and encourage you to think about all sides of the issue. Most importantly, remember the definition of a good decision is subjective. If the decision to leave a company is your own, even when you understand and perhaps welcome or expected the change, dealing with the implications of this change can be challenging. Give yourself time to reflect, knowing you have to understand how you feel as well as what you think about the facts of the situation. Decide what you want in the context of what you need and really care about now and for the longer-term. 3. Transition is a good time to learn more about yourself. Create space and time to explore which of your many strengths can help you move forward and deal with feelings of being overwhelmed. If you do this you will in time understand more about yourself: what you want and care about. Taking time to regularly work through your thoughts, separating them from your feelings, eating well and doing activities you enjoy can provide a useful structure for your day. This can make transition more enlightening. Taking the time to consider some simple techniques when life gets tough or you are feeling overwhelmed or anxious might seem difficult. I can promise you this approach will make such a difference to how you feel in the long-term. Here are two articles for coping during times of change. The first article helps you describe your strengths from a number of perspectives. The second article is all about dealing with anxiety. Article when you are feeling anxious. Many of my clients find it useful to record their day, including good and not so good experiences. For example, if you have a propensity to overeat or drink in times of stress then using your phone to take a picture or keeping a journal about what you eat can be a useful technique. This can be just what is needed to help you feel more in control. Don’t forget to also record the highlights of your day. Again, taking time to reflect on these activities at your chosen time each day can provide the structure necessary to focus our attention during a transition period. Remember to record the highs as well as any lows. This process will help you accelerate success: whatever success means to you at the moment. A little knowledge can be useful. There are so many books out there about coping with change. However, reading a book at a time of transition might be a strain. I have therefore given you these two diagrams to think about. They are two sides of the same coin: the first diagram is written in a formal language while the second charts the change curve in emotional language. The erratic lines on the first diagram are to remind you what you already know: the curve is not smooth. So at 10am on any one day you might be at the hopeful realism stage and then, just like that, you find you are back at the informed pessimism stage. From an emotional viewpoint you could be feeling angry and then find yourself feeling a sense of acceptance. My tip when referring to these diagrams is to say to yourself something like this: where am I right now on each graph in relation to a specific or general point? Then ask yourself a second question: what do I need to think, feel or do to move myself to a better place on the graph? I have used these graphs in many situations, such as helping a team decide on a business acquisition proposal or if an individual client should take a role in another company. The graphs are always useful, so give them a try. One last point about the change curve. 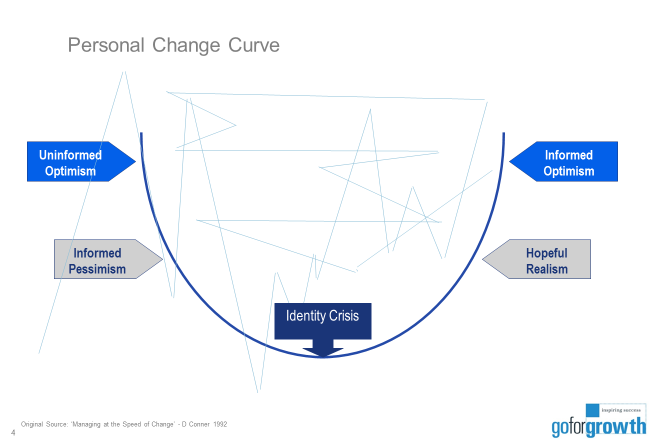 It is normal to enter what is called the identity crisis stage at the bottom of the graph. It is typically accompanied by thoughts like – who am I – what am I supposed to be – where am I in all of this… what is the point? If you find yourself thinking in this way, please understand these thoughts and feelings are OK. Try the breathing exercises; speak to a trusted friend or adviser, take a walk outside, and maybe click on the link and work through the article about anxiety. You might also feel that a trip to your GP is worth your time. You are in control. Client example – The dismissal [Note: This case study is a composite of various client experiences over the last 15 years]. Some-time ago, a client (a senior leader with an excellent track record) told me he had to leave his job, maybe even change his career, because he just did not feel valued. He felt like a cog in a wheel rather than a person made of flesh and blood like everyone else. According to his appraisal and 360-feedback, this client was a high achiever and took his own development seriously. He got things done on time and under budget; dealt with issues; was a team player who was on the ball when it came to performance management; displayed well above average negotiating skills. He was no saint but he was described by many as a great colleague. The client was ambitious and his appraisal confirmed he had the potential to develop further in the company. However, for reasons that may never be fully understood, one Monday morning this client was called into a meeting and asked to leave the building. It was not a matter of performance or inappropriate behaviour. He was bluntly informed that there was going to be a change and he was not part of the company’s future. On reflection, a few weeks later the client recalled many changes had taken place across the organisation over the past 2 years; his face no longer fitted and it was his time to go. At the moment of dismissal, the client was relieved, angry and felt as if he was somehow having an out of body experience. He wanted to run, fight, shout and cry all at the same time. He had difficulty breathing properly and hearing what his leader was saying. He felt physically sick. Despite all of these thoughts and emotions, all he could manage on that Monday morning was to return to his office, collect his coat and go home. Once home he turned off his phone and went to bed. It was about 3pm in the afternoon. Around 4.30pm he got out of bed, called his lawyer, his wife and then his best friend. The next morning the client called me. Client example – Life after dismissal Over a period of months, the above client and I worked together to uncover what he really cared about. We discussed what was happening when he felt at his best and how things changed when he was not at his best. Finally, we discovered how the client could reenergise himself in the moment as well as draw energy from the world around him. The start of this process helped cultivate a deep understanding of his strengths, purpose and values: what constitutes meaning for his life and work. The second part of the process was more about getting out there again in a different capacity. This is not of course a fairy tale. Over three months the client had dealt with the administrative side of change and taken a much needed break. Over the subsequent three months the client decided to make a significant change to his career. He reconnected to what he held dear and most importantly acquired a better sense of himself: what he wanted and what he really cared about. The story is far from over. One last tip – Many of my clients want a short sentence they can to use when speaking to acquaintances, business contacts and even friends who ask how things are going. Only you know whom you want to confide in and have an open conversation about what you really think. In the meantime, many of my clients find the word sabbatical really useful. For example: “I’ve just left x and decided to take a well-earned sabbatical for three months.” “I’ve decided to take a much needed four month sabbatical. Although of course I’m still keeping my hand in on XYZ.” “I’m in the middle of a sabbatical which is fantastic and I’m thinking of exploring XYZ.” “I’m coming to the end of a much loved sabbatical and I’m now ready to XYZ.” Try this approach and see what you think.